﻿ Staircase Components | Scotia Stairs Ltd. 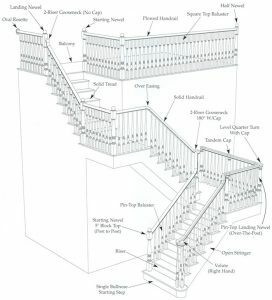 Listed below are the most common stair parts used to build a ‘post to post staircase’ and a ‘over the post staircase’. 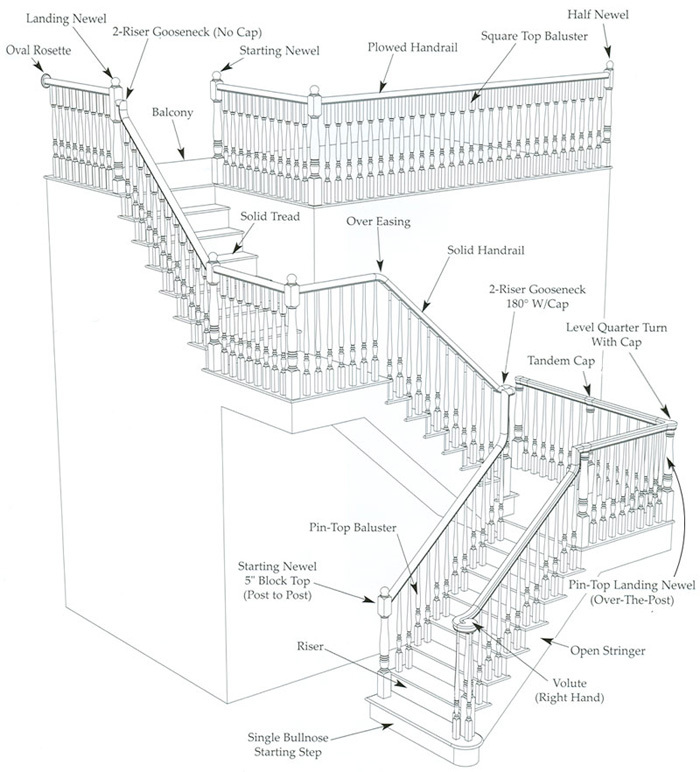 The staircase diagram below outlines the two handrail system types. Understanding the terms used to describe a stair makes it easier to be specific about what you want when ordering a stair. These terms are also used in the captions on our photographs. It is also crucial that you understand what is written on your quotation, so you know what to expect and can compare prices accurately between vendors. Baluster: A vertical member used between railing and tread or floor, adding safety, support and stability to the balustrade. Balustrade: The name for the complete and assembled rail system. Box Newel: A large square newel hollow inside, used in post to post balustrades. Box Stair: A stair where the stringers house the treads and risers forming a box-like unit. Cove Moulding: Cove Moulding is a finishing trim used to go under the treads front side where the riser meets the bottom of the stair treads underside, to hide the little 1/8 in. and 1/16 in. gaps that may be there after the install. Ogee Cove Moulding also is used under the front nose of the stair nosing on any level run stair nosing that is installed on the job… once again hiding all the drywall dips along the walls face. Easing: (Sometimes called Easement) That portion of a rail fitting which curves, permitting hand rail to move from level up or down, up easing or over easing respectively. It also permits rake rail to move vertically where it meets level rail. Fillet: A thin moulding that is fitted into plowed hand rail and shoe rail between balusters. Finished Floor to Finished Floor Height: The vertical distance between the top of the lower finished floor to the top of the upper level finished floor. The total rise of the stair. Glue Block: A wooden block, square or triangular, glued to the underside of a step. They are used where the tread and riser form an inside corner under each step. Gooseneck: A rail fitting used where rake rail rises vertically to a balcony or landing. They also permit directional changes. Hand Rail: The railing used as hand support in balustrade systems. Header: A floor framing member that runs across the well opening. The top riser of the stair is secured to the header. Horse: A length of dense dimension lumber cut to run rise requirements to form steps. The horse supports treads and risers. J Cap Moulding: The J-Cap Moulding is used like a mini nosing to cover ( cap ) this unfinished edge of the side skirt boards, thus giving a finished look to this otherwise raw edge. So if you have 32 feet of skirt board, you will need approx 36 feet of J-Cap Moulding for proper coverage. Landing: An intermediate floor or platform between flights of stairs. Landings permit directional changes in stair travel. Landing Newel: The newel post used at landings and upper levels where rake rail changes direction and continues or where rake rail rises vertically to meet level rail. Length is typically 42″ long, if you want to meet a 36″ rail height code -or- 48″ long newel post get used if you want to meet a 42″ rail height code. Landing Tread: A nosed and rabbeted tread-like mould used to form a level surface with the finished floor of landings and upper levels. May also be used to trim around well holes and balconies. Left Hand Miter: A stair open for balustrade on the left side, ascending the stair. The rail fittings on the left hand side of the stair. Level Quarterturn: A rail fitting that permits level hand rail to turn 90 degrees; available with cap or without cap. Level Rail: Handrail used on the level portion of a balustrade. Miter Return: A nosed or rounded moulding used to trim, open end treads. This conceals the end grain. Newel: A vertical post used to start the balustrade, also used at points of vertical and directional transition. Newel posts are the backbone of balustrade strength. Open Stair Treads: A stair where the stringer has been cut out and the tread ends are exposed on one or both ends. Over-the-Post: A balustrade system which uses rail fittings on top of newel posts forming a continuous hand rail. Pitch: Refer to Rake of the staircase or railing system. Pitch Block: A block of wood that is cut to form a right triangle using the rise and run dimensions of the stair. The pitch block is used to determine the exact point and angle of cut for attachment of fitting to straight rail. The pitch block also determines the angle cuts on balusters, newel posts and hand rail. Post-to-Post: A balustrade system where hand rail is cut between and attached to square top newel posts. Rail Bolt: A two ended, threaded steel stud with nut, washer and wood plug. A concealed fastener used to attach hand rail to fittings and newels. Rail Fitting: Fittings are assembled components that are profiled to match hand rail patterns. They permit directional and vertical changes with hand rail in over-the-post balustrades. Some fittings may be used in post-to-post balustrades. Rake: The angle or pitch of a stair’s ascent to the upper level. The rake is established by the rise and run. Rake Rail: Hand rail used on the ascending portion of a balustrade, follows the pitch or rise of the stair. Right Hand Miter: A stair open for the balustrade on the right side, ascending the stair. The rail fittings on the right hand side of a stair. Rise: The unit of vertical height for each step in a stair. Determined by dividing the total finish floor to finished floor dimension into equal parts. Riser: The vertical component of a stair that faces each step between stringers and tread, upon which the treads are placed. Rosette: A decorative wall plate, larger than hand rail profile, may be round, oval or rectangular, serves as a railing anchor when backing is placed in the wall. Run: The horizontal travel of a stair. A unit of run or tread run is the distance of travel for each step excluding the tread nose. Shoe Moulding: A quarter round type mould, higher than wide, generally applied where bottom riser meets finished floor. Shoe Rail: A flat molded member with a linear groove to receive square bottom balusters for assembly. Skirt board: A finished face board used to cover the stair horse. May also be used to finish around the well hole. Starting Easing: A rail fitting that starts the balustrade system and introduces the user to the upward travel of the stair. Starting Newel: The vertical post used to start a balustrade system. These newel post are typically 48″ long. Starting Step: A decorative first step of a stair. Generally includes tread and riser which lengthen the step beyond the width of the basic stair. Designs are bull nose fully rounded, quarter circle or half circle. Stringer: A side member of a stair that serves both carriage and finished face. It is generally routed out to receive treads and risers for box stairs. It is mitered to the riser with treads set on top for open stairs. Sub Rail: A thin linear mould plowed both top and bottom to receive hand rail above and the top of square end balusters below. Tread: The flat horizontal component of a stair step upon which a person walks… a standard tread is 1-1/16 inch thick. Wall Rail: Hand rail affixed to the wall by means of mounting brackets. It may be primary hand rail for a box stair and supplementary to a balustrade system. Wall Rail Bracket: An offsetting metal bracket -or- hardwood bracket that gets screwed to the wall upon which wall rail is mounted. Wedge: A tapered strip of wood driven into stringer routings to fasten treads and risers securely. They also help to prevent squeaks. Well Hole: The opening frame into floor above a stair. Winder: A landing divided by risers into triangular shaped steps, usually two or three steps. Caution should be taken when planning to use them as they restrict tread area as they climb and turn. Wood Plug: A flat round wooden plug usually 1/2 inch -to 1 inch in diameter, used to plug the holes bored for concealed fasteners.